Snapshots are point-in-time backups of a cluster. There are two types of snapshots: automated and manual. Amazon Redshift stores these snapshots internally in Amazon S3 by using an encrypted Secure Sockets Layer (SSL) connection. Amazon Redshift automatically takes incremental snapshots that track changes to the cluster since the previous automated snapshot. Automated snapshots retain all of the data required to restore a cluster from a snapshot. You can create a snapshot schedule to control when automated snapshots are taken, or you can take a manual snapshot any time. When you restore from a snapshot, Amazon Redshift creates a new cluster and makes the new cluster available before all of the data is loaded, so you can begin querying the new cluster immediately. The cluster streams data on demand from the snapshot in response to active queries, then loads the remaining data in the background. When you launch a cluster, you can set the retention period for automated and manual snapshots. You can change the retention period for automated and manual snapshots by modifying the cluster. You can change the retention period for a manual snapshot when you create the snapshot or by modifying the snapshot. You can monitor the progress of snapshots by viewing the snapshot details in the AWS Management Console, or by calling describe-cluster-snapshots in the CLI or the DescribeClusterSnapshots API action. For an in-progress snapshot, these display information such as the size of the incremental snapshot, the transfer rate, the elapsed time, and the estimated time remaining. To ensure that your backups are always available to your cluster, Amazon Redshift stores snapshots in an internally managed Amazon S3 bucket that is managed by Amazon Redshift. Amazon Redshift provides free storage for snapshots that is equal to the storage capacity of your cluster until you delete the cluster. After you reach the free snapshot storage limit, you are charged for any additional storage at the normal rate. Because of this, you should evaluate how many days you need to keep snapshots and configure their retention period accordingly, and delete any manual snapshots that you no longer need. For pricing information, see the Amazon Redshift product detail page. When automated snapshots are enabled for a cluster, Amazon Redshift periodically takes snapshots of that cluster. By default Amazon Redshift takes a snapshot about every eight hours or following every 5 GB per node of data changes, or whichever comes first. Alternatively, you can create a snapshot schedule to control when automated snapshots are taken. Automated snapshots are enabled by default when you create a cluster. Automated snapshots are deleted at the end of a retention period. The default retention period is one day, but you can modify it by using the Amazon Redshift console or programmatically by using the Amazon Redshift API or CLI. To disable automated snapshots, set the retention period to zero. If you disable automated snapshots, Amazon Redshift stops taking snapshots and deletes any existing automated snapshots for the cluster. Only Amazon Redshift can delete an automated snapshot; you cannot delete them manually. Amazon Redshift deletes automated snapshots at the end of a snapshot’s retention period, when you disable automated snapshots for the cluster, or when you delete the cluster. Amazon Redshift retains the latest automated snapshot until you disable automated snapshots or delete the cluster. If you want to keep an automated snapshot for a longer period, you can create a copy of it as a manual snapshot. The automated snapshot is retained until the end of the retention period, but the corresponding manual snapshot is retained until you manually delete it or until the end of the retention period. To precisely control when snapshots are taken, you can create a snapshot schedule and attach it to one or more clusters. When you modify a snapshot schedule, the schedule is modified for all associated clusters. If a cluster doesn't have a snapshot schedule attached, the cluster uses the default automated snapshot schedule. A snapshot schedule is a set of schedule rules. You can define a simple schedule rule based on a specified interval, such as every 8 hours or every 12 hours. You can also add rules to take snapshots on certain days of the week, at specific times, or during specific periods. Rules can also be defined using Unix-like cron expressions. On the Amazon Redshift console, you can create a snapshot schedule. Then, you can attach a schedule to a cluster to trigger the creation of a system snapshot. A schedule can be attached to multiple clusters, and you can create multiple cron defintions in a schedule to trigger a snapshot. You can define a schedule for your snapshots using a cron syntax. The definition of these schedules uses a modified Unix-like cron syntax. You specify time in Coordinated Universal Time (UTC). You can create schedules with a maximum frequency of one hour and minimum precision of one minute. Amazon Redshift modified cron expressions have 3 required fields, which are separated by white space. The , (comma) wildcard includes additional values. In the Day-of-week field, MON,WED,FRI would include Monday, Wednesday, and Friday. Total values are limited to 24 per field. The - (dash) wildcard specifies ranges. In the Hour field, 1–15 would include hours 1 through 15 of the specified day. The * (asterisk) wildcard includes all values in the field. In the Hours field, * would include every hour. The / (forward slash) wildcard specifies increments. In the Hours field, you could enter 1/10 to specify every 10th hour, starting from the first hour of the day (for example, the 01:00, 11:00, and 21:00). Snapshot schedules that lead to backup frequencies less than 1 hour or greater than 24 hours are not supported. If you have overlapping schedules that result in scheduling snapshots within a 1 hour window, a validation error results. When creating a schedule, you can use the following sample cron strings. Every hour between 2pm and 8pm on Tuesday. Every night at 9pm Monday–Friday. Every 6 hour increment on Saturday and Sunday starting at 30 minutes after midnight (00:30) that day. This results in a snapshot at [00:30, 06:30, 12:30, and 18:30] each day. Every 4 hour increment starting at 12:30 each day. This resolves to [12:30, 16:30, 20:30]. You can create multiple cron schedule definitions within as schedule. For example the following AWS CLI command contains two cron schedules in one schedule. create-snapshot-schedule --schedule-identifier "my-test" --schedule-definition "cron(0 17 SAT,SUN)" "cron(0 9,17 MON-FRI)"
You can take a manual snapshot any time. By default, manual snapshots are retained indefinitely, even after you delete your cluster. You can specify the retention period when you create a manual snapshot, or you can change the retention period by modifying the snapshot. If you create a snapshot using the Amazon Redshift console, it defaults the snapshot retention period to 365 days. If a snapshot is deleted, you can't start any new operations that reference that snapshot. However, if a restore operation is in progress, that restore operation will run to completion. Amazon Redshift has a quota that limits the total number of manual snapshots that you can create; this quota is per AWS account per region. The default quota is listed at AWS Service Limits. Because snapshots accrue storage charges, it’s important that you delete them when you no longer need them. Amazon Redshift deletes automatic and manual snapshots at the end of their respective snapshot retention periods. You can also delete manual snapshots using the AWS Management Console or with the batch-delete-cluster-snapshots CLI command. You can change the retention period for a manual snapshot by modifying the manual snapshot settings. You can get information about how much storage your snapshots are consuming using the Amazon Redshift Console or using the describe-storage CLI command. By default, all user-defined permanent tables are included in snapshots. If a table, such as a staging table, doesn't need to be backed up, you can significantly reduce the time needed to create snapshots and restore from snapshots. You also reduce storage space on Amazon S3 by using a no-backup table. To create a no-backup table, include the BACKUP NO parameter when you create the table. For more information, see CREATE TABLE and CREATE TABLE AS in the Amazon Redshift Database Developer Guide. You can configure Amazon Redshift to automatically copy snapshots (automated or manual) for a cluster to another region. When a snapshot is created in the cluster’s primary region, it will be copied to a secondary region; these are known respectively as the source region and destination region. By storing a copy of your snapshots in another region, you have the ability to restore your cluster from recent data if anything affects the primary region. You can configure your cluster to copy snapshots to only one destination region at a time. For a list of Amazon Redshift regions, go to Regions and Endpoints in the Amazon Web Services General Reference. When you enable Amazon Redshift to automatically copy snapshots to another region, you specify the destination region where you want snapshots to be copied. In the case of automated snapshots, you can also specify the retention period that they should be kept in the destination region. After an automated snapshot is copied to the destination region and it reaches the retention time period there, it is deleted from the destination region, keeping your snapshot usage low. You can change this retention period if you need to keep the automated snapshots for a shorter or longer period of time in the destination region. The retention period that you set for automated snapshots that are copied to the destination region is separate from the retention period for automated snapshots in the source region. The default retention period for copied snapshots is seven days. That seven-day period only applies to automated snapshots. In both the source and destination regions, manual snapshots are deleted at the end of the snapshot retention period or when you manually delete them. You can disable automatic snapshot copy for a cluster at any time. When you disable this feature, snapshots are no longer copied from the source region to the destination region. Any automated snapshots copied to the destination region are deleted as they reach the retention period limit, unless you create manual snapshot copies of them. These manual snapshots, and any manual snapshots that were copied from the destination region, are retained in the destination region until you manually delete them. If you want to change the destination region that you copy snapshots to, you have to first disable the automatic copy feature and then re-enable it, specifying the new destination region. Copying snapshots across regions incurs data transfer charges. Once a snapshot is copied to the destination region, it becomes active and available for restoration purposes. If you want to copy snapshots for AWS KMS-encrypted clusters to another region, you must create a grant for Amazon Redshift to use a AWS KMS customer master key (CMK) in the destination region. Then you must select that grant when you enable copying of snapshots in the source region. For more information about configuring snapshot copy grants, see Copying AWS KMS-Encrypted Snapshots to Another AWS Region. A snapshot contains data from any databases that are running on your cluster, and also information about your cluster, including the number of nodes, node type, and master user name. 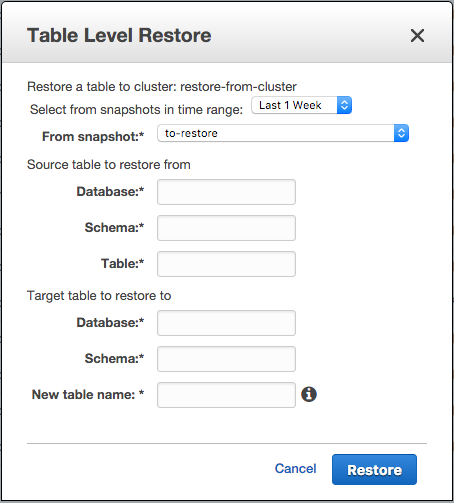 If you need to restore your cluster from a snapshot, Amazon Redshift uses the cluster information to create a new cluster and then restores all the databases from the snapshot data. The new cluster that Amazon Redshift creates from the snapshot will have same configuration, including the number and type of nodes, as the original cluster from which the snapshot was taken. The cluster is restored in the same region and a random, system-chosen Availability Zone, unless you specify another Availability Zone in your request. When you restore a cluster from a snapshot, you can optionally choose a compatible maintenance track for the new cluster. You can monitor the progress of a restore by either calling the DescribeClusters API action, or viewing the cluster details in the AWS Management Console. For an in-progress restore, these display information such as the size of the snapshot data, the transfer rate, the elapsed time, and the estimated time remaining. For a description of these metrics, go to RestoreStatus. You cannot use a snapshot to revert an active cluster to a previous state. When you restore a snapshot into a new cluster, the default security group and parameter group are used unless you specify different values. You can restore a single table from a snapshot instead of restoring an entire cluster. When you restore a single table from a snapshot, you specify the source snapshot, database, schema, and table name, and the target cluster, schema, and a new table name for the restored table. The new table name cannot be the name of an existing table. To replace an existing table with a restored table from a snapshot, rename or drop the existing table before you restore the table from the snapshot. The target table is created using the source table's column definitions, table attributes, and column attributes except for foreign keys. To prevent conflicts due to dependencies, the target table doesn't inherit foreign keys from the source table. Any dependencies, such as views or permissions granted on the source table, are not applied to the target table. If the owner of the source table exists, then that user is the owner of the restored table, provided that the user has sufficient permissions to become the owner of a relation in the specified database and schema. Otherwise, the restored table is owned by the master user that was created when the cluster was launched. The restored table returns to the state it was in at the time the backup was taken. This includes transaction visibility rules defined by Redshift's adherence to serializable isolation, meaning that data will be immediately visible to in flight transactions started after the backup. You can restore a table only to the current, active running cluster and from a snapshot that was taken of that cluster. You can restore only one table at a time. You cannot restore a table from a cluster snapshot that was taken prior to a cluster being resized. Choose Clusters and choose a cluster. Choose the Table restore tab. In the Table restore panel, select a date range that contains the cluster snapshot that you want to restore from. For example, you might select Last 1 Week for cluster snapshots taken in the previous week. From snapshot – The identifier of the cluster snapshot that contains the table to restore from. Database – The name of the database from the cluster snapshot that contains the table to restore from. Schema – The name of the database schema from the cluster snapshot that contains the table to restore from. Table – The name of the table from the cluster snapshot to restore from. Database – The name of the database in the target cluster to restore the table to. Schema – The name of the database schema in the target cluster to restore the table to. New table name – The new name of the restored table. This name cannot be the name of an existing table in the target database. Choose Restore to restore the table. If you have restored at least one table from a cluster snapshot, you can copy the values from a previous table restore request into a new table restore request. This approach means you don't have to retype values that will be the same for several table restore operations. In the Table restore tab, choose an existing table restore status. The following example uses the restore-table-from-cluster-snapshot AWS CLI command to restore the my-source-table table from the sample-database schema in the my-snapshot-id. The example restores the snapshot to the mycluster-example cluster with a new table name of my-new-table. You can share an existing manual snapshot with other AWS customer accounts by authorizing access to the snapshot. You can authorize up to 20 for each snapshot and 100 for each AWS Key Management Service (AWS KMS) key. That is, if you have 10 snapshots that are encrypted with a single KMS key, then you can authorize 10 AWS accounts to restore each snapshot, or other combinations that add up to 100 accounts and do not exceed 20 accounts for each snapshot. A person logged in as a user in one of the authorized accounts can then describe the snapshot or restore it to create a new Amazon Redshift cluster under their account. For example, if you use separate AWS customer accounts for production and test, a user can log on using the production account and share a snapshot with users in the test account. Someone logged on as a test account user can then restore the snapshot to create a new cluster that is owned by the test account for testing or diagnostic work. A manual snapshot is permanently owned by the AWS customer account under which it was created. Only users in the account owning the snapshot can authorize other accounts to access the snapshot, or to revoke authorizations. Users in the authorized accounts can only describe or restore any snapshot that has been shared with them; they cannot copy or delete snapshots that have been shared with them. An authorization remains in effect until the snapshot owner revokes it. If an authorization is revoked, the previously authorized user loses visibility of the snapshot and cannot launch any new actions referencing the snapshot. If the account is in the process of restoring the snapshot when access is revoked, the restore runs to completion. You cannot delete a snapshot while it has active authorizations; you must first revoke all of the authorizations. AWS customer accounts are always authorized to access snapshots owned by the account. Attempts to authorize or revoke access to the owner account will receive an error. You cannot restore or describe a snapshot that is owned by an inactive AWS customer account. After you have authorized access to an AWS customer account, no IAM users in that account can perform any actions on the snapshot unless they have IAM policies that allow them to do so. Once access to a snapshot has been revoked from an AWS account, no users in that account can access the snapshot, even if they have IAM policies that allow actions on the previously shared snapshot resource.